THE LITTLE GIRL IN YOU LLC. Sells dolls and accessories,Dollhouses and accessories,Greeting Cards,Diecast and model Autos,Figurines,Wooden ship models,Stuffed animals and End of Time Religous material. PLEASE CLICK ON THE "PRODUCT CATALOG" BUTTON ON TOP LEFT OF THIS PAGE TO SEE WHAT WE HAVE TO OFFER YOU. We are a full service Dollhouse Store,We Build,Remodel,update,improve all types of dollhouses and we sell most of the Popular dolls along with their accessories.What we don't have in the store we usually can get through a catalog that our customer can page through.When ordering from a catalog it usually takes a week or less for your order to arive at the store. 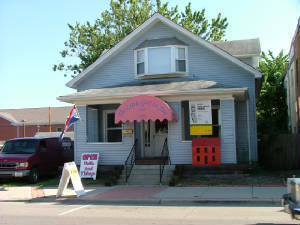 We have been in business for over 20 years and accept all major credit cards.Our Brick and Mortor Business is located at 306 Harrison Ave.,Harrison,Ohio 45030-1332 and our phone numbers are: Local 513 area is -367-7708,.We are located in the historic district of Harrison, Ohio, across the street from the Harrison Police Station.Our hours of operation are 10:00am to 7:00pm Monday thru Friday and 10:00 Am to 5:00 Pm Saturday and we are closed Sunday. Our brick&mortor store used to be located in Cheviot at 3512 Harrison Ave.before we moved to our present location.The new store is twice the size as the one in Cheviot use to be.Please come by and see us sometime. We Are always looking for New Dollhouse Manufactures and Doll Manufactures,so if you find a Dollhouse or Doll that we don't have in our store,Please get the name of the Manufacture,the name of the Dollhouse or Doll and tell us in person or E-mail it to us at thelittlegirlinyoullc@fuse.net .WE THANK YOU FOR YOUR INTEREST IN OUR WEBSITE. We are a Full Service Dollhouse Company,we build,alter,update and improve all types of dollhouses and we give free estimates before we draw up the contract and do the work.